University of Wisconsin-Green Bay Associate Prof. Clifton Ganyard is the recipient of a 2014 UW System Board of Regents Teaching Excellence Award, which will be presented Friday, June 6 at the Board of Regents meeting in Milwaukee. Ganyard, Humanistic Studies (History), is one of two UW System teachers to receive the 2014 accolade. The award includes a $5,000 stipend to be used for professional development. Ganyard joined the UW-Green Bay faculty in 1997 as an adjunct instructor, and in 17 years on the job has taught more than two dozen courses for Humanistic Studies, History and Global Studies. His areas of specialization include modern European, German and Japanese history and culture, Western civilization and European intellectual history. Ganyard has numerous publications to his credit, including “Artur Mahraun and the Young German Order: An Alternative to National Socialism in Weimar Political Culture” (2008), as well as a number of scholarly reviews. Ganyard’s many awards include UW-Green Bay Research Scholar, Grants in Aid of Research, Teaching Enhancement and Teaching Fellow honors, as well as UW System and Beloit Center for Language Studies grants, among others. In 2010, Ganyard earned the UW-Green Bay Founders Award for Excellence in Teaching, and in 2010-11 he took a sabbatical to study at The Yamasa Institute, Okazaki-shi, Aichi-ken, Japan. For Ganyard, it all stems from a genuine enthusiasm for what he does. Ganyard’s passion for interdisciplinary teaching has been demonstrated in numerous ways throughout his career, including through a course he team-taught with Music faculty member Adam Gaines during spring semester 2013. Jazz history course “The Jazz Age” combined Ganyard’s historical expertise with the music and performance knowledge of Music Associate Prof. Adam Gaines. The course included live jazz performances and a rich exploration of the history of the art form, including the social and political contexts with which it evolved. A UW-Green Bay News video offers additional insight into the course: www.youtube.com/watch?v=JFDynmjOFNM. Ganyard is the latest in a series of several recent UW-Green Bay Regents Teaching Excellence Award winners. 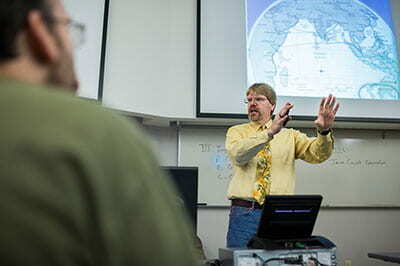 In 2011-12, UW-Green Bay Prof. Regan A.R. Gurung, Psychology and Human Development, earned an individual Teaching Excellence Award, and UW-Green Bay’s Professional Program in Education earned Department of the Year honors for its outstanding teaching. More information about these awards and others is available on the University’s Institutional Honors page, www.uwgb.edu/honors/. This entry was posted in Announcements, Headlines, Leading & Learning, News, News Releases and tagged faculty, History, Humanistic Studies, Liberal Arts and Sciences, teaching excellence awards, UW System on May 9, 2014 by Kelly Moore.